It is a career highlight to serve on a panel discussion addressing assessment. My question comes from my colleague John Barell who has written a book by this same title. I asked this question to my national teacher professional groups and I received answers from many of them. How do we know if we are sufficiently preparing the students of today for the challenges of the 21st century? Inquiry-based education leads to problem-solving and provides specific steps for pre, formative and summative assessment that informs instruction of 21st century skills. My PLN was a great resource of information. I received information, advice, and resources from educators in 10 states. Special thanks to Dr. Joyce King who provided so many timely resources. As educator I. Ramirez explains, “we just find out that our school in Clark County will be rated (range 1-5 star school) base on student ACT performance. Therefore, our school system regarding standardized testing must change if we want to accomplish a 5 star rating. From now on students (freshman- Junior years ONLY) will be practicing 3-5 times per year taking a computer based test called CERT (CERT (College Equipped REadiness Tool). The output data from the student’s results will give us a prediction of how we’re doing as a school. In our math classes, for example, our warm up activities are ACT practice released problems. We want our students to get familiar with standardized testing vocabulary. We want our students to be considered proficient. In Clark County, ACT average composite scores are about 18 points. To be considered proficient, students must score 22 or more on the composite results. We know it will be a great challenge, however, myself I’m excited to fase this challenge. We know it will be a process to switch around from the low proficient to the proficient status, and also we know it may take some time to accomplish this academic goal, because we can do vertical alignment instruction. What I think is the real challenge is to create a culture of students interested to do well on these standardized assessments. Upon reflection, educator Dave P. shared that “New York State implemented a ‘teacher assessment program’ and if teachers do not pass it they are put on probation and can be removed the following year if they do not show improvement – regardless of tenure. What I found interesting about this is that student assessment involves regurgitation of facts on multiple choice tests, even if the test includes open ended questions or work there is always a MC section. The teacher assessments require the observation of student involvement in the learning process, open ended questioning, Bloom’s Taxonomy, and other measures that go beyond the mere memorization of facts… [this] shows the state understands students need to do more than memorize facts, but this doesn’t match up to student assessments. Dave continues with this observation, “another part of the “teacher assessment” was that your students show “growth” over the year. So, to do this many teachers give impossible (“impassible”) BENCHMARK tests at the beginning of the year and compare the results on the final exam. Not exactly supported by science. My point; it’s all a game and depending on how you play it you can win without trying. Jean H. provides a tidy summation and call to action. Special thanks to these helpful folks: John Barell, Dr. Joyce King, Dave P., Dr. Ashley Cross, I. Ramirez, Jean H., Mark Barnes, Sylvia Ellison, Lev Vygotsky, Donald Schon, and Paulo Friere. Check the blog tomorrow for my Top Ten Take-aways from the Panel Discussion. 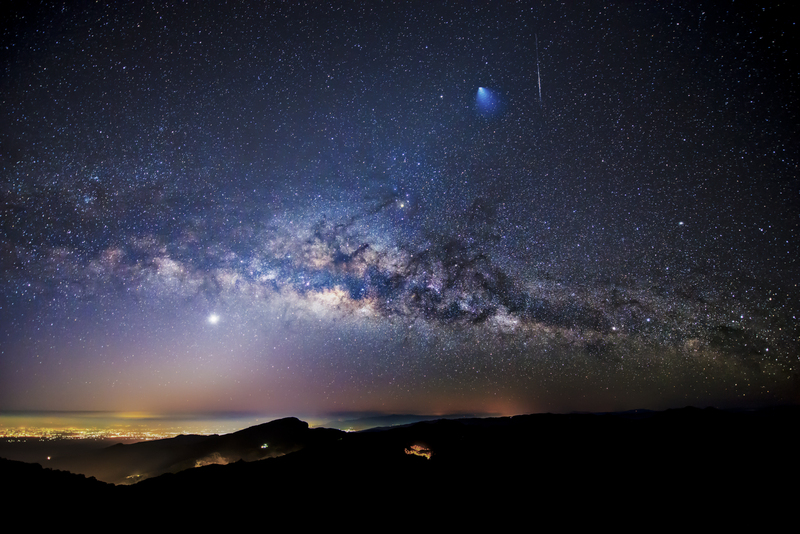 Continuing in the spirit of inquiry, the website SallyRideScience (https://sallyridescience.com) is a splendid resource for all those conducting investigations about the natural world. Category. John wrote, “Investigating the natural world is that area of inquiry where we’re always asking What? Why? How Come?” Take a look at SallyRideScience. Author, friend, and mentor John Barell emailed a great link for a Pinterest Board featuring his work on the subject of Wonder. There are so many excellent educational resources on Pinterest. But I have not seen a board dedicated to the subject of Wonder. Check it out! Did You Ever Wonder? What is your favorite quote about Wonder? 1. How does inquiry-oriented education function in the classroom? 2. Just exactly how does it look? 3. How do I model this approach for my students? Here, in a concise, video, author John Barrell, models this approach with a group of elementary students. This is a wonderful example of inquiry-learning in process. And they also may scare us to quivering mush! Toward a realm where the teacher is not the all-seeing, all-knowing Carnac of the Classroom. Thank Goodness! What a Relief! Realize this and you will live longer and have more fun! 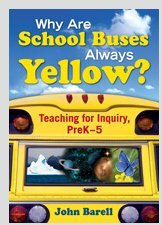 “Why Are School Buses Always Yellow” encapsulates years of theory into workable practice. I probably would have saved thousands in college tuition loans if this resource had blessed me decades ago! (virtual “Wish I’d had a V-8” moment)! Barell reiterates that questions signal higher-order thought processing which is the goal of effective classroom interaction and innovation. 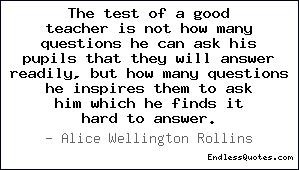 He reminds us that student questions are the attainment of the highest thinking skills. It is what we trained for people! 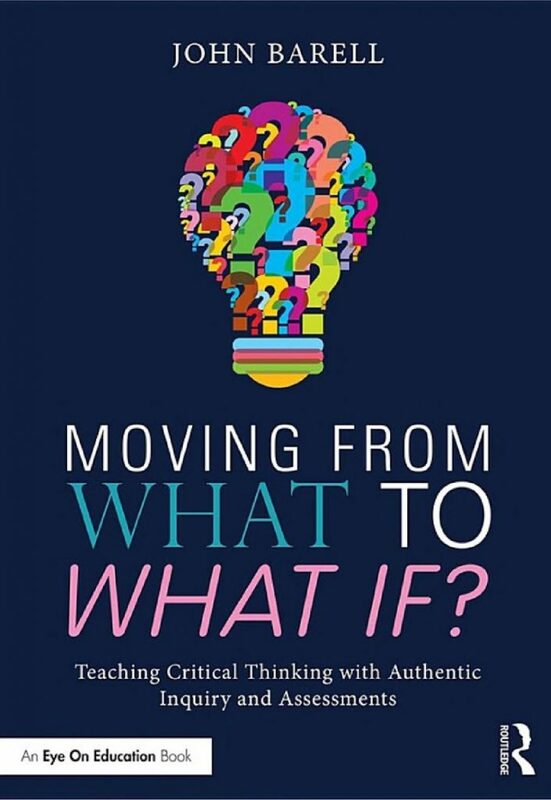 Too many books declare WHAT an important concept inquiry teaching is. But, after the studies are noted and the experts quoted, there are very few pages left for the actual implementation: HOW TO DO inquiry-oriented teaching. 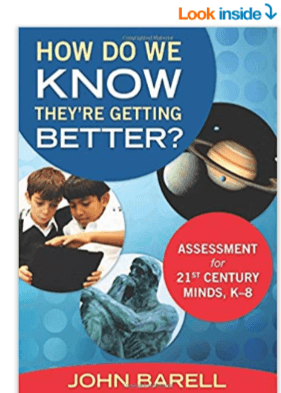 It’s about time that a book came along that speaks to “HOW” to reach and develop inquisitive questioning. Barell’s visits to classrooms and discussions with both teachers and students form a dynamic role-play model. You will no doubt relate to the student responses and learn from modeling Barell’s effective inquiry teaching practices. I also appreciate the structure of the chapters. Barell allows space for reflection, an often overlooked phase of learning. Granny Newlen always admonished us kids to “Learn, discuss, then then get up and move.” She used such a phrase to get us up off the couch for learning-walk where we would tell her what we had learned at school.